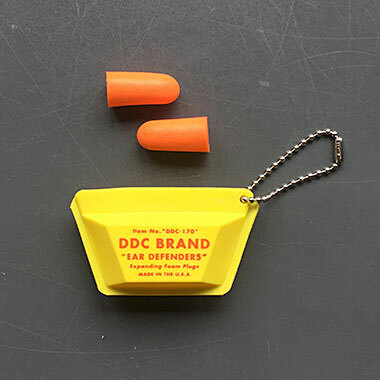 Draplin Design Co.: DDC-170 "Ear Defenders"
In 1993, just as we were readying ourselves to move out west, we all went downstate to see Dinosaur Jr St. Andrew’s Hall in Detroit. And the one piece of merch I got from that show was a green ear plugs pouch with a Dinosaur Jr logo on it. I still have that thing, and for each rock show I go to, I cringe taking it with me. I’m always afraid I’m gonna lose the thing. I found a crappy shot of it online, so click here to see that pouch. So I’m decided to give that cherished souvenir a break, and made my own DDC set. That’s what you are seeing here. As the brother of a successful audiologist little sister, take my word on this: Always wear you ear plugs at rock shows! Dr. Sarah Catherine Draplin Au.D. taught me that one! 01. “Overload Orange” hot-stamped on “You Bet Yellow” Dupont ELVAX resin pouch. 02. Scuff resistant pouch with superior flexibility. 03. Durability tested to 50,000 openings and closings! Who let the dogs out? 04. 2-1/2” x 1-3/16 x 5/8” in dimension. 05. Each pouch comes with two Radian Resistor ear plugs. 07. Silver beaded chain included, so you can attach it to you car keys. 08. Proudly made in the U.S.A.